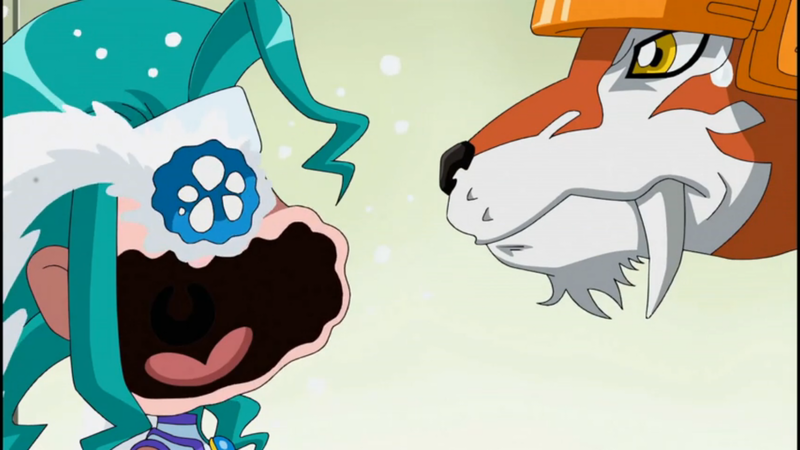 Digimon: System Restore: Fusion Episode 38: Psych-Out in Cyber Land! After that dramatic cut scene, it's time for Robot Master #4! While the first three Dark Generals weren't bad, and while the really heavy stuff doesn't hit us until Gravimon, this is where the show really starts to kick into a higher gear. Now the fourth Dark General doesn't offer anything new to the plot (the fifth does), and his defeat is ultimately no more dramatic than any of the first three generals (the sixth is), nor does it take any longer (the seventh does). Instead Cyber Land gives us a pair of episodes that bring the best out of the main characters, showing us just how much personality we've secretly got here. They're put in interesting situations and forced to use more than brute strength to get out of it. Just as importantly, this episode is absolutely hilarious. Seriously, Luca's attempts to open the warehouse door might be the funniest moment in the franchise. 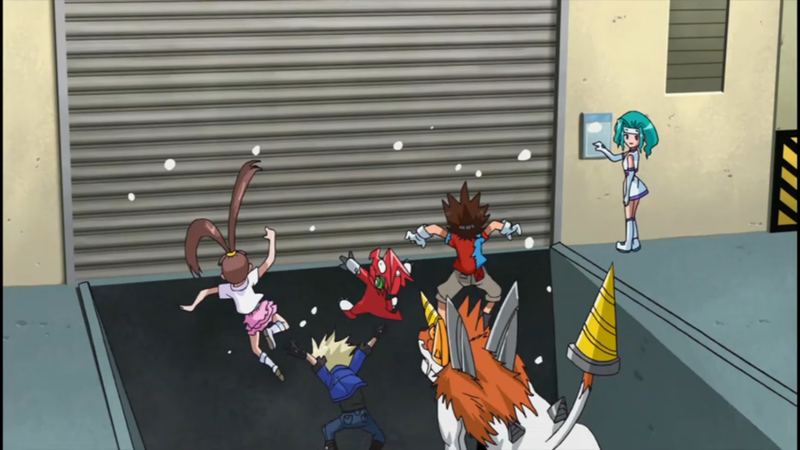 Particularly in the dub, which not only neutered the best parts of Adventure's crazy hitchhiking scene, it gave Shoutmon a great punchline (pun intended). Through the whole episode, Luca is an absolute treasure. Equal parts cute, annoying and clumsy, she draws most of the team to not only help her, but trust her to help them find food and resources. Luca is weaponized moe, forcing the Fusion Fighters into unsafe levels of feels and nearly getting them all killed in the process, save for Dorulumon (who smells a rat) and Christopher (who is incapable of feels). After being mostly quiet so far this season (for much of the first half too, for that matter), it's a bit of a jolt to suddenly have Dorulumon suddenly in the spotlight again. With the short two-episode arcs requiring a lot of action and keeping the plot from getting too expansive, it's easy for these veteran members of the team to fall through the cracks. Breaking in the likes of Dracomon and Mervamon doesn't make it any easier (remember Dracomon? I promise we'll see him again). That's one of the coolest things about the Splashmon and Olegmon arcs- turning our focus back to Dorulumon and Ballistamon respectively. Dorulumon isn't just paranoid in his suspicions of Luca; he smells something funny and isn't afraid to call her out. His canine nose and instincts aren't the only things that make this the perfect angle for him. Even though he's been on the team for so long, his prior employment and unsociable behavior keep him detached from everyone else. It doesn't mean that they don't trust him, but it makes it harder for him to convince them that Luca may be up to no good, especially as her cheeriness wins them over, particularly her adorable responses to his accusations. Yet even when he's irritating the others by “reflexively” destroying Luca's gifts, Mikey insists that he would never return to the Bagra Army. Splashmon, for his part, is really going hard to gather that negative energy for Bagramon. It makes sense that he's targeting the Fusion Fighters since they seem to be the only living inhabitants of Cyber Land. This changes his mission from simply destroying them to making them miserable. Simply attacking them endlessly (which, ironically, he is uniquely equipped to do) isn't going to cut it. Hence deploying Luca, her efforts to sew discord either through herself or additional splashers, and ultimately torturing Dorulumon. Between the Cutemon impersonation, nearly drowning him with some mad waterbending and ultimately locking him away and convincing his friends he's gone bad, can you call it anything else? That's probably the best thing about the episode: as silly as things get with Luca around, the sight of Dorulumon in such a bad state and an imposter leading the enemy army against Mikey still remains a damn good cliffhanger. Originally, I was going to point out the fallacy of hiding Luca way up inside airship Whamon, given how unlikely it was that the team would fly into it. Then I realized that Splashmon could very well have hidden multiple versions of Luca, or different girls under different names, around Cyber Land for the Fusion Fighters to find. As you ponder the implications of that, imagine Mikey finding and dragging around four or five of those things. Christopher doesn't really welcome Luca either, which fits his character. Equally fitting is the way he doesn't really side with Dorulumon either. He just wants her to shut up. Shoutmon's line after all the door gags, totally a dub insertion, was “I'd like to punch her button.” That's wrong no matter how you interpret it. It's a rare “getting crap past the censors” moment for Fusion and we should be proud of them! As someone who thought the name “drippin” was just dumb, I fully support renaming them “splashers,” even if it sounds like the name of a fruit candy. Hey, that would be a great merchandise tie-in! The “cockroach girl” line comes off as some pun in Japanese that got lost in the translation. He's actually referring to her antenna hair, which could have been implied better. Probably the best unspoken yet impactful implication of Dorulumon's absence is that Mikey's stuck using Shoutmon X2 for the first time in forever.